After the success of their blockbuster hit movie 'Can't Help Falling In Love', Kathryn Bernardo and Daniel Padilla went to Japan to celebrate the latter's birthday. The two enjoyed their trip in the other country. However, an incident happened wherein the actor shook the cherry blossom tree - a major no-no in Japan- just to get a perfect photo. 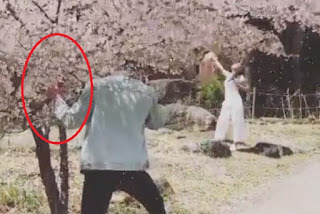 The actor was caught in a video shaking the tree in order to have its petals fall down as he took a photo of his rumored girlfriend.